Floral Rangoli Designs for Indian Wedding Decoration! We say rangoli, you hear Diwali! Right? Right. But what if we told you, you shouldn’t keep those swift wrist movement rangoli skills bound to just Diwali! Floral rangoli designs are the new, up and coming trend at weddings both, in India as well as abroad. While powdered rangoli designs will always remind us of warm jalebis and even warmer hugs during Diwali, these floral rangoli designs have taken up a new space in our hearts and we love it! 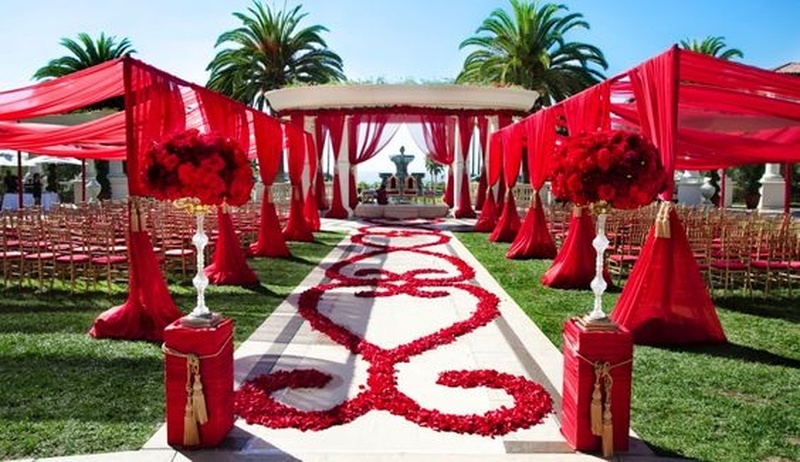 Floral rangoli designs across wedding aisles, statement rangoli installations paired with pretty candles, or even walkways beautifully abounding with flower petals galore – Indian wedding decoration has a whole new desi twist with this trend. All you need to make this idea work is a stunning design and a whole bunch of pretty petals! No kidding. Since gendha phool has always been a favourite in the Indian wedding scene, you need not go to exotic, expensive flowers to bring a unique kind of feel to your wedding decoration. Believe us when we say even gendha phool, roses and jasmine petals work just as much magic into this floral rangoli concept as orchid or lilies would. Marigold flowers galore! 3D flowers - a new trend to try at your Indian wedding! How stunning is this flower petal aisle? Ethnic designs and floral petals like these go hand in hand! Chandelier paired with a desi rangoli design? Yes please! Red swirls and twirls so pretty! Scalloped borders that won't be disrupted, beware of kids though! A classic circular floral rangoli placed right in the centre of your aisle - what do you think of this idea? Swirls and Twirls like these are just plain stunning! Petals create magic, we say!